A spinal cord injury can be complex and a have a massive impact on your life or the life of a loved one. Many spinal cord injuries are irreversible and can require extensive and long term medical care. If you have been the victim of a spinal cord injury, you may be focused entirely on your recovery, but you also need someone to be focused on your rights. Stephen M. Forlizzi is a personal injury lawyer in Massachusetts and can be the advocate you need when you need it most. A spinal cord injury can happen as a result of a car accident, motorcycle accident, construction accident, or a work injury. When you have suffered a spinal cord injury, it can truly affect every aspect of your life. You may suffer from partial or total paralysis, meaning a lifetime of dependence on others and possible lifelong disability. You might have to endure surgeries to repair damage and may need ongoing therapy to maintain any level of recovery you may be able to achieve. With severe spinal cord injuries, your career could be over, your schooling interrupted, and your entire family dynamic could be changed forever. The staggering financial reality of medical bills, lost wages, and continued medical therapies can be difficult to put a price tag on. The emotional toll a spinal cord injury can have on victims can be immeasurable. You need an experienced and compassionate spinal cord injury attorney who will take the time to fully grasp what the injury has cost you and your family. The Law Office of Stephen M. Forlizzi will help determine what you may need now and in the future to ensure you recover as much as possible. With us in your corner, you can focus on recovery while we focus on aggressively fighting for you. Our firm will investigate the facts of your case, line up medical experts, and gather all evidence and documentation to present your case. Resources: The National Spinal Cord Injury Association was established in 1948 and their mission is to help improve the quality of life of all paralyzed Americans. Our goal is to help you through this difficult time in any way possible. 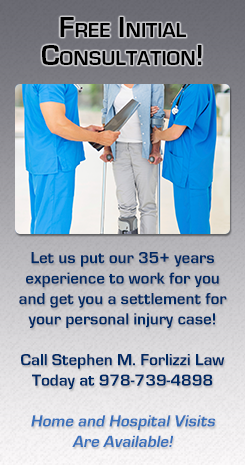 If you are still in the hospital or at home recovering, we can come to you to assess your case. Call the Law Firm of Stephen M. Forlizzi for a free consultation to see if we may be able to help you get the compensation you need and deserve.